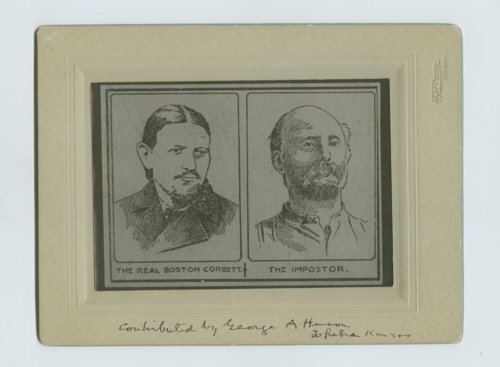 Side-by-side sketches of the real Boston Corbett and the imposter. Thomas P. "Boston" Corbett, who was the Union Army soldier who killed Abraham Lincoln's assassin, John Wilkes Booth. The imposter shown in this photograph could be John Corbit. See Kansas Memory unit 307443 for documents relating to his impersonation of Boston Corbett.